Faith Erin Hicks' Friends With Boys is the first graphic novel that I read as part of the judging for the final round of the 2012 Cybils. If this is a sign of the books to come, I am so excited to read the other nine finalists. 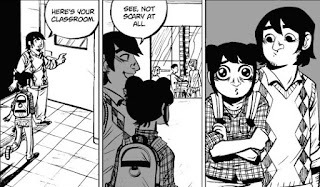 Maggie spent her entire life being homeschooled with her three older brothers, but her mother has left them, so she must face ninth grade in a public school for the first time. In addition to the stress of making new friends, finding her way around, and navigating life without her brothers, she is followed by the ghost of a mariner's wife. The inclusion of the ghost reminded me of 2011 Cybils nominee Anya's Ghost, and also was the least necessary part of the story for me. It didn't tie up neatly and didn't add much to the characters I cared about. As for characters I cared about, there were plenty. Maggie is fantastic and realistic, and her relationship with her brothers was refreshing. Not all teens hate their siblings, and it's nice for them to see themselves reflected in literature. Actually, a lot of different types of people show up in Hicks' work; this broad spectrum drives home the message to be yourself. If that isn't clear enough, a reformed jerk says, "I don't want to be that guy being an *** to that other guy just because he does theater instead of sports, okay? That crap stays for life, whether we want it to or not." The coming of age aspect of the novel felt real; not everyone is forgiven, just like in everyday life. Hicks' illustrations are detailed and expressive. 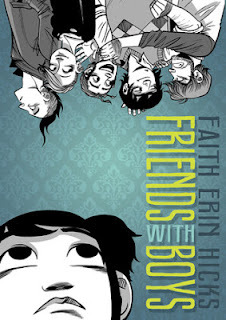 The characters have flaws and look normal, keeping with the realistic feel of Friends With Boys. This is a book that I would share with all ninth graders who are concerned about finding their place in high school.